Heavy snows in April are fairly common in Minnesota's past. The transition from winter to spring can spawn some rather strong storms and given the right conditions, can also tap into leftover cool air from the winter. Looking through historical anecdotes, the greatest chance of having a large snowstorm appears to be in the first half of the month. One of the greatest April snowstorms (besides the April 5-7, 2008 event) was the storm that began on April 5, 1933. The old Pigeon River Bridge crossing in Cook County saw 28 inches in one day from that storm. This still stands as the 24 hour state record for snowfall in April. Two Harbors in Lake County saw 17 inches of snow from the 1933 storm. Another April snowstorm is the April 17-19, 2013 event that brought 17.7 inches at Duluth and 7.3 inches in the Twin Cities. The largest April snowstorm in the Twin Cities was the April 13-16, 2018 Thunder Blizzard that dropped 15.8 inches at the Twin Cities International Airport. Another historical snowstorm is the event that unfolded beginning on the morning of April 19th and ending on April 21, 1893. When it was all over 30 inches buried St. Cloud, with 24 inches in a single day. The 1893 Minnesota Weather Service bulletin describes this storm. 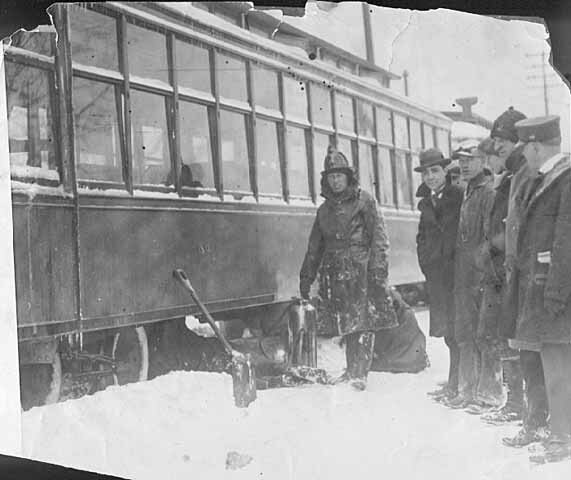 "The (Low) caused the most disagreeable weather of the month, heavy snow fell varying in depth from six to thirty-six inches throughout the state: railroad lines were blocked, and traffic of all kinds was almost entirely suspended." The Twin Cities saw 10 inches from this event and this is the fourth largest April snowstorm in the Twin Cities. Definitely more rare are May snowstorms. One of the largest happened On May 2-3 1954. A swath of 10 inches to a foot fell from Clearwater to the Iron Range, closing rural schools and setting May snowfall records that stand to this day. The second largest April snowstorm in the Twin Cities happened on April 14, 1983. A strong area of low pressure had ample moisture to work with and deepened over northern Iowa as it moved to the east and northeast. The event started as rain on the 13th and changed over to snow during the wee hours of April 14th. Persons in east central Minnesota were surprised to wake up to a foot of snow on the ground. The grand total at the Twin Cities airport from that storm was 13.6 inches. The Metrodome deflated for the third time since its construction in this storm. (The first two times were Nov 21, 1981 and December 30, 1982.) Over 400 schools canceled class on April 14 and the University of Minnesota shut down at 2:30pm. Residential mail deliveries and pickups were canceled for only the third time in 20 years. The Twin Cities International Airport was shut down for 5 hours from 9am to 2pm on the 14th. An account of the April 19-21 1893 snowstorm is recalled by climate historian Tom St. Martin. One of the worst late season blizzards in Upper Midwest history brought a record 15 inches of snow to the St. Paul area on 20-21 April 1893. Headlines in the 20 April edition of the St. Paul Dispatch told winter weary St. Paul residents that "Old Boreas Favors Us: Just One More Blizzard to Add to His Generous Gifts of Winter: Snow Covers Entire Northwest To A Depth Varying From Six Inches To Two Feet." On 21 April, the second day of the historic blizzard, another set of headlines proclaimed "Swirling Snow: Serious Floods Are Feared: Railroad Traffic On Some Lines Suspended". The blizzard which struck much of Minnesota, Iowa and sections of northern Missouri was part of an intense storm system which formed "below Kansas" and which brought severe weather, including tornadoes, to large portions of the central United States from 19-22 April 1893. In Minnesota, Bird Island reported a "three day blizzard" with 15 inches of snow; St. Cloud reported 30 inches of snow (probably referring to drift depths, not to average snow depth); Faribault reported a "blinding wind and snow storm"; Northfield reported "two feet of snow on the level"; Park Rapids reported 20 inches of snow; and several carloads of cattle were reported to have perished when a train become stalled near Granite Falls. In St. Paul, heavy "wet and soggy" snowfall was accompanied by temperatures in the high 20's and low 30's F. Although sleighing was said to be possible, "wheeled" travel was reported as "difficult" on St. Paul streets (Unfortunately for St. Paul residents, most sleighs had already been packed away for the season). Much railroad traffic was delayed, with trains running three to six hours behind schedule during the peak of the storm. The heavy wet snow and high winds were considered to be particularly detrimental to agricultural interests, both because of the expected delay in farm work (which had already been slowed by a wet and cold spring) and because of anticipated damage to recently sown crops. A total of 2.33 inches of moisture was recorded at the St. Paul weather station from 19 through 21 April, 1.63 inches of which fell (along with 14 inches of snow) on 20 April. The storm came at the end of a very cold winter and early spring season. St. Paul temperatures averaged well below normal during January (4 F), February (10 F) and March (23 F). February was also wet, producing 20 inches of snow. April 1893, due in large part to the 20-21 April blizzard, was also abnormally wet (with 5.30 inches of moisture). In contrast, the summer of 1893 was much drier and somewhat warmer than normal.